Yesterday, the Human Rights Campaign (HRC), honoured the lives of the 49 people – most of them young, LGBTQ and Latinx – killed in the attack at the Pulse Nightclub in Orlando on June 12, 2016. “Every day, we carry forward the memories of the 49 people whose lives were cruelly and tragically taken at Pulse,” said HRC President Chad Griffin. “As our nation marks two years since this tragedy, we must never lose sight of the unfulfilled hopes, the families shattered and the love lost in this preventable act of mass murder. The thousands more killed by gun violence since Pulse underscores the glaring failure of our elected officials to take common sense steps to combat the scourge of gun violence that plagues our nation. On Tuesday, HRC staff and members marked the day by holding a public reading of the victims’ names, and observing a moment of silence at the HRC headquarters in Washington, D. C. at 12:00PM. 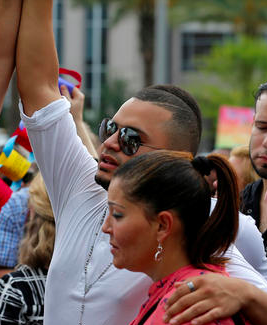 The Pulse Nightclub shooting, which took place at an Orlando LGBTQ nightclub on Latinx Night, was the deadliest mass shooting in modern American history, until the tragic mass shooting on October 1, 2017, during an outdoor concert in Las Vegas. In the days immediately following the Pulse attack, HRC transformed its headquarters into a tribute to the victims, installing their images in their front windows. The eight-story composite carried the message “We Are Orlando,” and drew thousands who came to mourn, seek comfort and pay their respects. That month, HRC also took the unprecedented step of formally endorsing common-sense gun violence prevention measures, and has since been working with organizations including Everytown for Gun Safety, Giffords, Brady Campaign and many others to push elected officials to pass lifesaving reforms. Last year, to mark the one-year anniversary, HRC unveiled a monumental art installation by world-renowned artist Megan Geckler. They stand with Orlando and with the survivors, and the families and friends of the 49 siblings, parents, friends and loved ones taken that day. “We are Orlando. And as we mourn, we also recognize that in the face of adversity, our community always rises, together”. The Human Rights Campaign is America’s largest civil rights organization working to achieve equality for lesbian, gay, bisexual, transgender and queer people.